The department of Dermatology and Allergology has a clinical team consisting of 10 dermatologists, 15-20 residents, nurse practitioners and (senior) nurses. 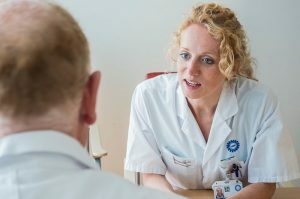 We treat patients with complex diseases in the field of (pediatric) dermatology and allergology at our outpatient departments in both the UMC Utrecht and the associated Wilhelmina Children’s Hospital. Additionally, our day care and inpatient wards allows for around the clock care and monitoring of difficult to treat dermatological diseases.